Ao no Exorcist at least didn't take off too far, but I admit that the anime disappointed me towards the end when it veered off so strangely. I've yet to watch or read Magi so I don't know how that one goes. Tsubasa Chronicles anime lacked impact for me, indeed I preferred reading the manga. Yeah,me too.I find them boring,extremely boring and way too perverted for my taste. I don't like anime made by Zexcs with the exception of Chrome Shelled Regios and conventional slice-of-life. I didn't hate la corda d'oro too much though. I really hate seeing the usual trope of a fanservice harem anime. I mean, it'd be great if they actually had something unique or different about them, but most of the ones I've seen just usually fall under the same predictable path. Of course, there are exceptions to the rule though. 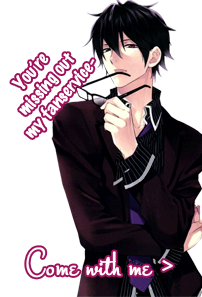 Purupuru wrote: I really hate seeing the usual trope of a fanservice harem anime. I mean, it'd be great if they actually had something unique or different about them, but most of the ones I've seen just usually fall under the same predictable path. Of course, there are exceptions to the rule though. I'm not the hugest fan of Sport anime... XD Though there have been some I like, Like Bamboo Blade, Prince of Tennis, Kuroko no Basuke... Otherwise... It's really boring for me haha. What? Cat Soup is fantastic! It's seriously a great show. KawaiiMess wrote: What? Cat Soup is fantastic! It's seriously a great show. What I refuse to watch is everything that is called anime, but looks like a normal cartoon, I also hate everything that is too silly. I also need decent art in anime most of the time. Also, I think I only enjoy anime if I watch it before reading the manga - I seem to prefer the manga-style most of the time, not to mention that I often am annoyed when the anime is too different from the manga, in a negative way of course. like a normal cartoon, I also hate everything that is too silly. "Anime" is just another word for "animation/cartoons", though? I actually dislike seeing shows that try to play it too safe or pander too much in terms of design. I understand how tough it is to take a risk designwise, but I also don't think that writing off cartoonier, less sterotypical "Japanimation" styles as somehow "not counting as Japanese animation" is entirely fair. Its weird because I like bishies and all. But Harem mangas or animes are not my thing at all. There is just too many charcters to focus and it becomes lame.